2018 Billboard Music Awards (Sunday, 8/7c, 5 PT, NBC): The TV season’s final musical-awards blowout is among its starriest, and this year’s extravaganza from Las Vegas, hosted by Kelly Clarkson, boasts the first live TV performance by Janet Jackson in nine years, as she accepts the coveted ICON Award (joining the ranks of Cher, Prince, Stevie Wonder, Neil Diamond and Jennifer Lopez — the latter also set to perform.) Among the superstar pairings: Christina Aguilera and Demi Lovato, Macklemore and Kesha, and Salt-N-Pepa will celebrate the rap trio’s 30th anniversary of being the first female rappers to crack the Top 20 on Billboard’s Hot 100 by performing with En Vogue. Kelly Clarkson is hosting the live event on May 20. Fahrenheit 451 (Saturday, 8/7c, HBO): The dystopian scenario is as chilling as ever in director Ramin Bahrani’s sleek adaptation of Ray Bradbury’s classic about a totalitarian society that has banned and burns books — and much art and music — in an attempt to rewrite history and extinguish original thought. The casting is impressive: Michael B. Jordan (Black Panther) and the ubiquitous Michael Shannon (Waco) as celebrated “firemen” who torch printed “graffiti” in public spectacles. Unfortunately, Jordan’s conversion (via a Dostoevsky tome) never feels completely convincing, and despite strong production values, this comes off like an overlong and underpowered episode of Black Mirror. Saturday Night Live (Saturday, 11:30/10:30c, NBC): Tina Fey is having another great year. A multiple Tony nominee for the Broadway musical adaptation of Mean Girls, she also scored in her recent sit-down with David Letterman on Netflix, where a new season of Unbreakable Kimmy Schmidt launches at the end of the month. She returns to the show that put her on the map for her sixth time as guest host in the season finale, featuring the outspoken Nicki Minaj in her third tour as musical guest. He got his start in student government. Brooklyn Nine-Nine (Sunday, 8:30/7:30c, Fox): We’re so glad this isn’t the end of watch for these crazy cops. 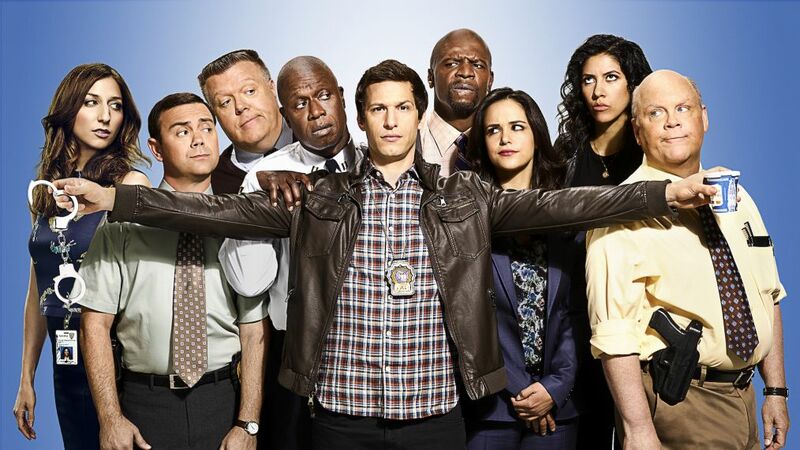 Rescued from cancellation by NBC, Brooklyn Nine-Nine ends its fifth season with Jake (Andy Samberg) and Amy (Melissa Fumero) fielding multiple crises, including a possible bomb threat and the return of Amy’s still-smitten ex, Teddy (Kyle Bornheimer), on their hectic wedding. Jane the Virgin’s Gina Rodriguez drives by in a fun cameo as a possible new soulmate for Rosa (Stephanie Beatriz), and Capt. Holt (Andre Braugher) is on the brink of learning whether his dream of becoming Commissioner will come true. The comedy was canceled by Fox earlier this week. Westworld (Sunday, 9/8c, HBO): In what could well become the most talked-about episode of the second season, Maeve (Thandie Newton) and her posse experience the heretofore unseen Shogun World park—described as being “expressly designed for those who find Westworld too tame… for true aficianados of artful gore.” And so it proves when the Western hosts meet their Eastern doppelgangers, and all bloody samurai hell breaks loose. 'I didn’t think that you should just stand there and just be a zombie,' said the actress. Inside Weekend TV: Royal rubberneckers will need to get up early on Saturday to watch the royal wedding of Prince Harry and Meghan Markle. Here’s a rundown of what to expect… A different sort of history could be made at the Preakness Stakes (Saturday, 5/4c, NBC) if Kentucky Derby winner Justify wins, setting up a possible Triple Crown finish… On the season finale front, CBS’s NCIS: Los Angeles (Sunday, 8/7c) ends its ninth season with eventful back-to-back episodes, in which Sam (LL Cool J) gets shot, and a new lead sends the team to Mexico to locate and rescue Mosley’s (Nia Long) kidnapped son… A reported nuclear attack has Elizabeth (Téa Leoni) and the rest of the world on edge in the fourth-season finale of CBS’s Madam Secretary (Sunday, 10/9c).